Grace and Frankie is getting ready for its third season on Netflix, but one of the stars was not too sure she could handle coming to the small screen. She now says that it is easy to work on season three. Season two premiered on Netflix earlier this month. Are you a fan of this series? Do you enjoy seeing Jane Fonda on Grace and Frankie? Tell us what you think. More about: Grace and Frankie, Grace and Frankie: canceled or renewed? Love, love the show. I hope there is more than a season three. The characters are great. I have been telling everyone about the show, it sure beats anything on tv. I love this show, it’s hilarious and amazing to see real life at 70+. Very encouraging an open minded. I love this show!! I can’t wait for season 3 to air! I love, love, lily Tomlin and Jane Fonda together! I love the show, Ms Fonda and Ms Tomlin are the female version of the Odd Couple, they fit so well together. I hope this show goes on for a long time. This show is an A plus…The actors and actresses are just great. I hope they continue this show for awhile. Can’t wait for season 3.. Great job.. I absolutely love this show. Just binge watched Season 2 and am sad that it is finished, can’t wait for Season 3! This is my favorite series on Netflix and I too hope there will be many more seasons. The whole cast is great but especially Lily Tomlin and Jane Fonda. They are perfect together! love it…can’t wait for season 3…please do not make so far inbetween the seasons…hard to wait! Great show! So funny and love that the characters are 70+ but continue to have real lives. Fabulous writing and acting. How can you fail with this cast. Just finished Season 2 and can’t wait for Season 3. I love the show! Please continue I’ve gone back to watching television once someone told to watch it. I love this show! It’s hilarious! I just finished watching season 2 of this fabulous show. I enjoyed season 1 but the second season surpassed it in every way. The writing and the acting are superb, and the issues go deeper and are more poignant. 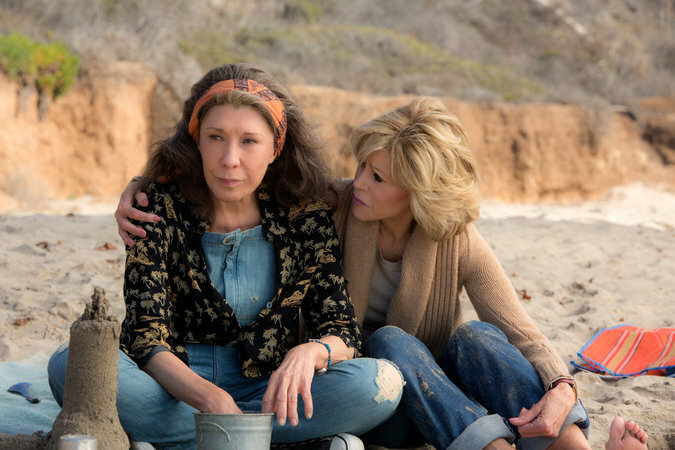 Jane Fonda and Lily Tomlin are perfect in their characters and relationship. The show in which Fonda gets drunk is amazing! I am so grateful for this refreshing and gutsy series. Bring on season 3! Go girls! Fabulous writing! The acting is superb and the combination of the characters Frankie and Gracie are just delightful.. The male leads are super as well! This is by far the very best show that I have ever, ever seen especially on Netflix. I am hoping that there will be not only a season 3…but, a 4, 5 and many more. The actors are all amazing as well as the storylines. I’m totally in love with this series and have been telling everyone that I know! PLEASE keep going with this show! It is soooo needed! Kudos to the writers and producers too!